In the classical approach of feng shui we can establish two basic work streams, firstly the study of landscape with its many elements and forms and on the other hand, the mathematical aspects that do order them in time and space, where the knowledge of the directions and the terrestral magnetism is fundamental. Obviously, the tool we need to find the space direction of a building is a compass, subject of this article. The invention of the compass is attributed to the Chinese the same as feng shui. In some texts it is mentioned the legend that the Chinese Emperor Huang-ti used the basic properties of the compass to guide his troops in a battle where invisibility was caused by fog around the year (2634 BC). The subsequent rediscovery of the compass in the West was indeed a great leap that served the epic journeys of humanity. 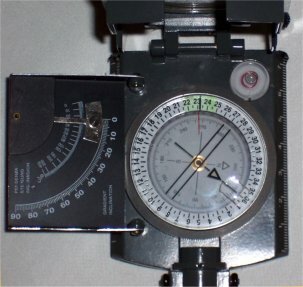 Using a compass is not of much complexity, although we must take some considerations into account to make reliable measurements. For example, if we are going to measure the front of a housing we will need to take in most cases several readings. 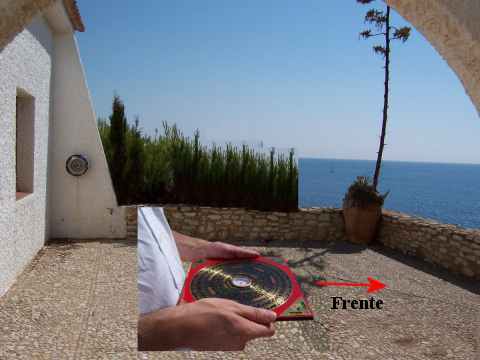 If we go out to the balcony of the house and note down the grades which are indicating the compass without other measurements, it is possible that you may end up with incorrect information, we will discuss that later. Many people who approach to feng shui, and in particular to the popular systems using the compass either Ba Zhai or Xuan Kong, want quickly to build up their geomantic chart. We have made this article to have a basic understanding of the measurement process where we will discuss the common types of compasses, the recommended steps for measurements and the registration of data within a table of orientations. 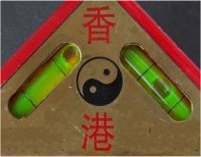 A first type bases its function on a “magnetic needle” usually divided into two colors, the norm in the West is the red pointing north and the black pointing south (magnetic poles). In addition to the needle there is a rotating ring that revolves 360 degrees and that is set manually to obtain a reference of the degreses. 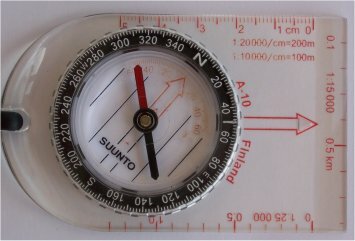 The Luo Pan or Chinese traditional compass is an example of this system. 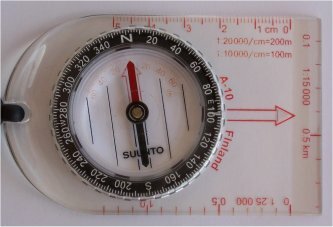 Some Chinese compasses unlike the ones of the West, use the white color of the needle to point north and the red for the South. The following photographs show the steps to get a lecture through a common compass of this kind. In most sports stores you can find similar models. Step 1: The external red arrow serves as reference for indicating the direction we're going to measure, it could be the direction that points the facade of our house. To read the degrees of that direction it is necessary to adjust the ring that incorporates the internal arrow so that it coincides with the magnetic north (red part of the needle). The next photograph below shows the subsequent step. Step 2: We have aligned the red needle (magnetic north) with the arrow inside moving the ring slightly to the left. To read the degrees we take the reference that indicates the outer needle. Note that it indicates about 100 degrees, equivalent to the East. The second type of compass incorporates instead of a needle a rotating magnetic disk with the degrees listed herein. In this system one prevents the subsequent adjustments of the needle in reference to an outer ring, which brings some comfort. You only have to direct the compass toward a specific position and wait til the ring in motion remains static reading later the degrees.This system can be found in situations where manual adjustment is not practical as in aircrafts, ships, cars, etc.. This rotating magnetic disk model is more advanced than the first model above. It incorporates an alignment system, helps to read slopes and the possibility of using a tripod to hold the compass completely static. 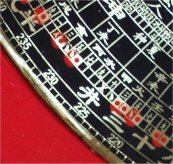 It is an recommended instrument for feng shui readings in which we seek some precision. A few degrees of difference in a geomantic chart off plan may be vital for a correct interpretation. 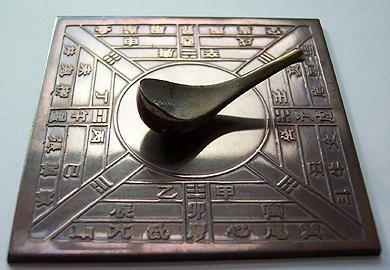 c) THE Luo Pan: Traditional Compass used in feng shui. The Luo Pan or (Lo'pan) uses the moving needle and an external plate full of information that is adjusted manually. 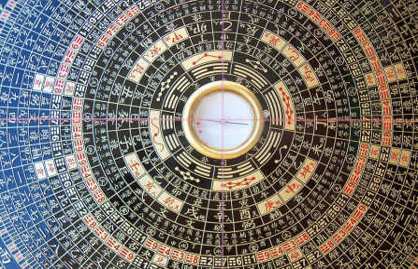 This compass usually has 2 strings that cut the plate into 4 sections indicating with precision the simultanous lectureof the front, the seat and both lateral positions as the 4 animal protectors of feng shui. There are different types of Lo'pan that differ primarily in the type of rings that they incorporate, we can find traditional models designed for the San Yuan, San He branch, aswell as made especially for some particular masters' preferences. We can see that besides the central magnetic needle there are also several concentric rings filled with information. On them are written dispositions like the 8 trigrams, the 8 directions, the 24 directions or mountains, astrological data as the 28 constellations, the celestial trunks, the earthly branches, and many other concepts that are applied to the art of feng shui. Some of the informative rings of the traditional Luo Pan are used in the "Yin" field of feng shui, which is oriented to buriels and the locating of tombs. 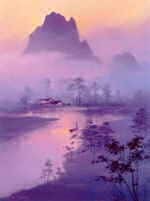 Today the majority of the masters focus their study in the "Yang " field also known as the study of the dwelling of the living, like houses, shops, etc.. In addition to the analog compasses above, today we count on digital compasses that offer a fast lecture, but if we go out to remote and inhospitable places with the classic compass, we have the advantage of having always energy available!. 2.- WHICH COMPASS SHOULD I ACQUIRE? Another distinctive though not essential, is the incorporation of vertical and horizontal alignment that supposedly serves to facilitate a free movement of the magnetic needle. Note: In actual practice, what you should finally observe is the floating of the magnetic needle itself, it could be the case that the levels are correct and the needle is stuck, therefore, the best advice is to focus only on the movement of the magnetic needle itself and forget about this detail. If you want to buy a Lo'pan it is also advisable to observe such issues as the exact alignment of the threads that cut the plate by checking the parallelism of these in the sections (north-south or 0-180 degrees as well as east and west or 90-270 degrees), it also should be noted that the plate rotates safely and it is vital that the inner needle is of quality. These final questions are the most important in relation to accuracy. For Western compasses look for a brand of proven quality and clarity in assessing the degrees. It is worth a small investment in a quality compass, as finally its accuracy and the good use made of it can make the difference between a correct or incorret feng shui chart. 3 .- THE BASIC THEORY OF THE CARDINAL DIRECTIONS. The common compass is divided into 360 degrees. What if we want to know the grades that occupy the 4 basic directions? We just have to divide 360 degrees in 4 parts with what we get the result that north, south, east and west are in a section of 90 degrees. The north would be located in this scale from 315 degrees to 45 degrees, the east from 45 to 135 degrees, the South from 135 to 225 degrees and the west from 225 to 315 degrees. Taking a more precise scale, as with the 8 basic sections 360 divided by 8, that is to say 45 degrees to each subdirection. Consider the calculated table underneath. Observe that here the North does not end at 45 degrees but in 22.5, this is the result of dividing the absolut North (360 degrees) in 2 parts distribuiting 22.5 degrees on each side. North is at the scale of 8 parts from 337.5 degrees to 22.5. The other directions are calculated consecutively in intervals of 45 degrees. The 24 mountains result from dividing 360 degrees in 24 points. Thus we have 24 sections of 15 degrees each. Here the 8 basic directions are divided in turn into three ranges, so we have South 1, South 2, South 3, North 1, North 2, North 3, or NW1, NW2, NW3, etc. The 24 mountains are used for advanced readings using the Xuan Kong Feng Shui system. The table of the 8 directions is used in the simplified east / west system or the Ba Zhai branch (8 houses). This information will help you to put the degress of a lecture inside of any of the 24 directions. If your house has the facade oriented toward 180 degrees, we would say that it's focused on S2 (172.5-187.5), "Wu" in the Luo Pan or simply "South" if we have a scale of 8 positions. Now we already have an idea of the most common types of compass and how to sort the information of the reading, now need to locate a reference to serve as an analysis in feng shui. The most common reference point for measurement is the main facing. In feng shui we believe the facing of a building the most relevant zone through which the Qi or energy introduces itself to a space. For example, in an apartment or flat in a city it is common to find the facing located in the most important windows of a livingroom, in the balcony overlooking a major street or in the area of best views, while the front door can be in a directional reference entirely. Therefore you must avoid the common mistake of associating unequivocally the main front door with the facing, although this condition is usually found in most classical buildings and rural areas. In feng shui the facing or "front" is more technically expressed as the most Yang part of the house, brightly or activated where the Qi is channeled into the housing. The Way of Qi towards the housing is provided at the same time by the aperture and lack of obstacles. The sitting is regarded as the opposite side of the facing. This also marks the types of housing in some feng shui systems. Once we have located the place of reading (the facing in the example) we have to proceed to locate us correctly for taking the degrees of the facing. Imagine that the front of the house that we are going to study is oriented to the sea (the space of the largest views, big windows, movement, etc.). To make the measurement we will locate our back parallel to the front and our face looking to the sea. In the photographic composition that we have made we can visualize perfectly our physical position to take the reading where we adjust our compass or Luo Pan to read the information of the facing. Do not forget to take the necessary precautions to ensure a reliable reading, in the following paragraph are some final instructions for the process. Something vey common when starting to take data with the compass is to consider readings inside a house for right without realizing that they can become completely wrong. The main reasons are due to magnetic disturbances in the modern world, either because of near metal elements or structural elements such as beams, pipes, wires or even electromagnetic pollution. It is advisable to go outside and take several external reference points along the facade. Sometimes, besides reading the facade, one should compare the seating or back of the construction, verifying that both sides (front and seat) keep proper relations. For example, if we have a reading of 90 degrees east in the front, in the seating our lecture must be around 270 degrees west. If we do not take the necessary precautions we can make an inaccurate reading and this would ruin the mathematical formulas used in the analysis and correction of a geomantic chart. Avoid measurements with "important" metal decorations on your body or very close to cars, lampposts or elements that do fluctuate a compass, do not place it either on the ground as there are often underground elements that alter the magnetism. If we have to realize any long distance consultation we must ensure that the process of the reading has been made thoroughly and correctly, since there is also a high risk of working with erroneous values. Once you've finished the reading, the next step is to prepare the geomantic chart. We leave at your disposal the helping software Feng Shui Numerology 3.16 for free to help you perform calculations for the construction and analysis of a Xuan Kong Fei Xing chart. The program shows each of the 24 mountains and their relationship to each magnetic section of the compass, the trigram of the house, the time, mountain and water stars, as well as the visitor stars of the year, the month and the period star. We can see the different special cases by color ads that are found in the different Xuan Kong charts. Finally, you can save and restore the information, allowing you to also create and maintain their own visual styles.